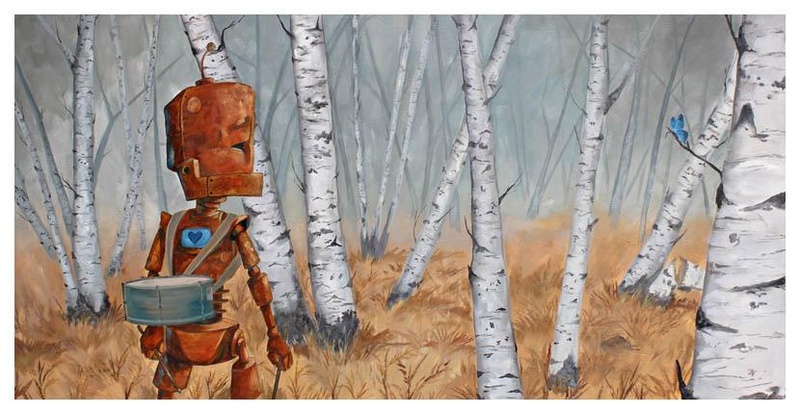 Drummer Bot is just wandering through a birch/aspen tree forest playing with the concept of "if a tree call and no one's there to hear it- does it make a noise"- but with a snare drum. Lauren Briere, in her early 30s, watches too many movies and eats popcorn as a meal more often than not. She grew up in Wrentham, MA and got her BFA in illustration from MassArt in Boston. She works in Austin, TX now and runs multiple projects from home. Her professional artist's resume consists of work ranging from children's book illustration, designer rain umbrellas "Over Our Heads", animated music videos (two of which for the awesomely sweet band, The Weepies), and quirky painting series made for her own amusement. Robots. Lots and lots of robots.